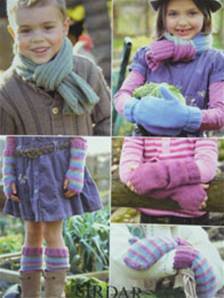 Ribby scarf 4-9yrs 100g, 10-12yrs 200g. All other one colour items 100g. 18st/ 24 rows to 10cm, 5mm needles. Recommended yarn Sirdar Supersoft aran. 4mm and 5mm needles.